"How do you tell someone it's over? You send them a notarized letter, right? Well, what if the recipient is your notary?" I never thought I'd feel such nostalgia for a website. When I first signed onto Hotmail I was still in junior high school. My parents were still married. I had never kissed a girl. The internet in all its sleazy glory was still a completely new idea to me. When I set up my first Hotmail account because the very concept of electronic mail itself as still a foreign concept. I marveled at the idea of sending out an instant letter to anyone else in the world with an account -- and for free, no less. I liked the idea so much that I even carried two address, one personal and other professional. I carried the Hotmail banner through every stage of my life between then and now. Since then, I've graduated both high school and college, gotten married, lived abroad, moved cross-country and back, changed careers and experienced the general ebb and flow of late childhood and early adulthood. All the while there was Hotmail, steadfast as ever. I started noticing a few years ago that my Junk E-mail folder was growing in confidence and size. It started with a few messages every now and again, but I just emptied the folder and moved on with my life. Then the messages began spilling over into my inbox, with ever-sneakier titles. The spam informing me of hot dates with non-existent people, cures for diseases I wasn't afflicted with and quotes on refinancing for homes I've never owned was easy enough to weed out. But then came the messages disguised as links sent from friends. And then the party was over. 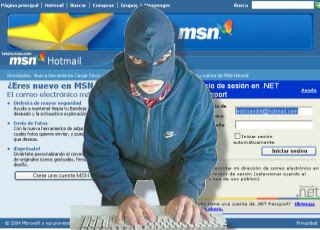 My Hotmail address, both personal and professional, have been hacked and I have no idea how to stop it other than to abandon ship. It's crushing to think that my contacts no longer trust messages sent from me and therein lies the fundamental flaw of Hotmail to begin with: I got what I paid for, which was nothing. These castles made of electronic sand have been washed into the sea and I'm filled with conflicting emotions. On the one hand I'm furious that someone took the time out of their day to develop a program that would commandeer my inbox and the inboxes of all my friends for no apparent reason. I'm sad that I have to shut down my accounts that I've had so long. I feel foolish that I feel either of those. So goodbye, Hotmail, we've had quite a time. I've been hired for jobs and quit them with your help. I've received romantic notes and breakup letters through your inbox. And now it's time to sign off.